A Toddler Was Hit By A Car in Bensonhurst. At First, The NYPD Said It Didn’t Happen. 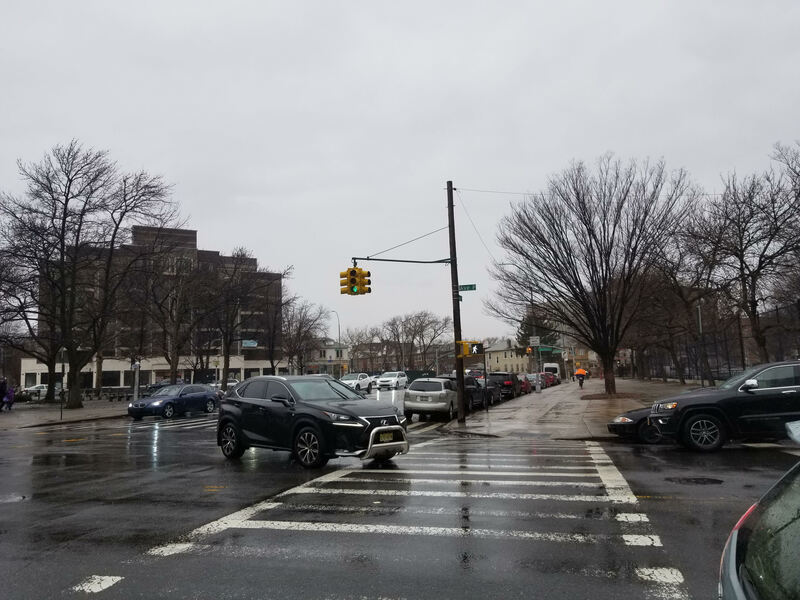 BENSONHURST – A three-year-old child and a 42-year-old woman were crossing the street when a car making a left turn struck them both in a school zone, landing them in nearby hospitals on March 20. Only this morning, March 22, did we finally get confirmation and details on the accident – almost 48 hours after the incident – a timeline that raises questions we aren’t immediately able to answer about how the city is tracking the pedestrian accidents that are central to Mayor De Blasio’s “Vision Zero” promise. The incident took place on Wednesday, March 20 shortly before 11:30 a.m. right by the entrance to the Lucretia Marcigliano Campus that is home to three elementary and one middle school. On the one side of Avenue P is the school, on the other Seth Low Playground. It is a “School Slow Zone,” meaning vehicles are required to slow down from 30 mph to 20 mph. Cops say a 58-year-old man was driving his 2016 Ford southbound on Stillwell Avenue. He then made a left turn heading eastbound on Avenue P when it was his turn. At the same time, a 42-year-old woman and a three-year-old kid were crossing the street on the crosswalk with the walk signal. The car struck them both. Police say the woman was taken to NYC Health + Hospitals/Coney Island and the toddler was taken to Maimonides Hospital. Both are said to be in stable conditions. Witnesses tell us that the car was making the left turn with great speed just as a group of pre-school age children was finishing crossing the street with their caretakers. The NYPD tells us that the driver was issued a summons for failure to yield the right of way – pedestrians have the right of way in crosswalks such as this one. “Failure to yield is a leading cause of crashes in New York City, and multi-lane intersections like Stillwell and Avenue P can be especially dicey,” Joe Cutrufo, spokesperson for Transportation Alternatives said. “I’m relieved that both victims of this reckless driver are in stable condition, and I wish them both a speedy recovery after this horrible ordeal,” said Council Member Brad Lander. The incident was reported around 11:35 a.m. on the Citizen app – someone filmed a few seconds from inside the Lucretia Marcigliano Campus and posted the video of a person being taken inside an ambulance. The video also showed a few police cars nearby, and another group of children crossing Stillwell Avenue heading for the Seth Low park, where the many schools and daycares that surround it share recess time. One of the updates on the Citizen app said: “Officers are requesting an ambulance for an injured child.” You can view it here. In another email, we included the link of the Citizen video. Hearing nothing back, we called them. They said there were no reports of a car striking someone in that area, leading us to wonder how a child can be hit by a car, land in the hospital, and there is no NYPD report available of the incident 24 hours later? The law should be no Cars should move when pedestrians are crossing when they have the right to cross, and what is this crap that’s going on with these drivers that stop right on the walk path instead of behind the line of the walk path, we either have to cross at times around them, and That they can turn on red while we’re crossing is another problem, if that mayor is so concern then he should change some rules. It was not just a woman and a toddler out walking. There were other children from a local daycare out for a walk. They were highly visible because they were a group. Regrettably, many drivers in this area are not civic-minded or abide by legal rules. So what will be done? The lack of concern for public safety in particular for pedestrians is beyond disheartening. The driver was just given a ticket???? For not yielding to pedestrians. This incident is unacceptable on the part of the driver and the LACK of police response and incompetency. A constant thing I am seeing with selfish reckless drivers is that they roll their vehicles as people are still walking in the crosswalk. But this incident clearly shows that the NYPD is manipulating statistics to make Vision Zero look like it’s succeeding. Drivers stopping in the cross-walk sometimes occurs when the driver is already in the cross-walk when the stop-light turns red. Not wanting to enter the intersection the driver is stuck in place and dare not move. Moving backward is more dangerous and the rules of the road are to just sit there. Of course, any driver approaching an intersection should be traveling at a speed that would allow a safe stop before the cross-walk and before the bike-zone. Creeping into the walk after stopping due to inattention is also dangerous. Bikes should also stop before the cross-walk. The city speed limit is 25mph. Where are they permitted to travel 30mph? The four-lane configuration is very dangerous, with left-turning drivers facing two lanes of oncoming traffic and honking drivers behind. Like it has done elsewhere, NYCDOT should reconfigure the lanes to include turn bays, calming traffic and stopping the dangerous weaving behavior between lanes.